The Village Times Herald published this piece in print on Sept. 01, 2016. 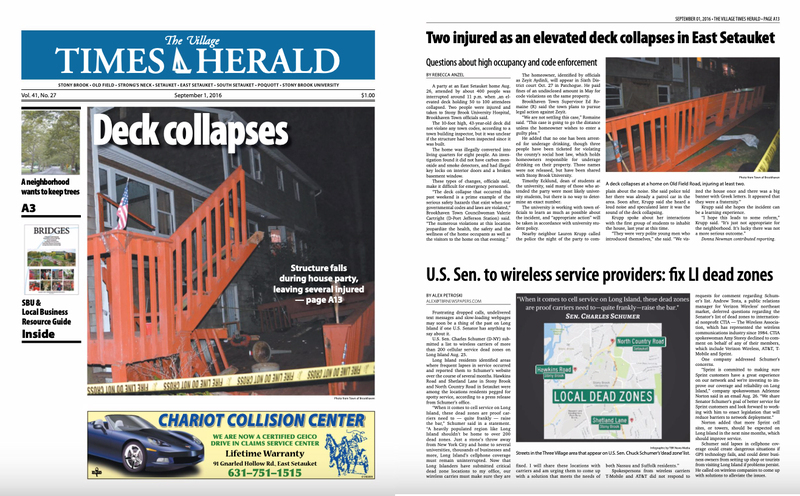 A party at an East Setauket home Aug. 26, attended by about 400 people was interrupted around 11 p.m. when an elevated deck holding 50 to 100 attendees collapsed. Two people were injured and taken to Stony Brook University Hospital, Brookhaven Town officials said. 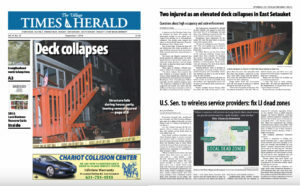 The 10-foot high, 43-year-old deck did not violate any town codes, according to a town building inspector, but it was unclear if the structure had been inspected since it was built. The home was illegally converted into living quarters for eight people. An investigation found it did not have carbon monoxide and smoke detectors, and had illegal key locks on interior doors and a broken basement window. These types of changes, officials said, make it difficult for emergency personnel. The homeowner, identified by officials as Zeyit Aydinli, will appear in Sixth District court Oct. 27 in Patchogue. He paid fines of an undisclosed amount in May for code violations on the same property. Brookhaven Town Supervisor Ed Romaine (R) said the town plans to pursue legal action against Zeyit. He added that no one has been arrested for underage drinking, though three people have been ticketed for violating the county’s social host law, which holds homeowners responsible for underage drinking on their property. Those names were not released, but have been shared with Stony Brook University. Timothy Ecklund, dean of students at the university, said many of those who attended the party were most likely university students, but there is no way to determine an exact number. The university is working with town officials to learn as much as possible about the incident, and “appropriate action” will be taken in accordance with university student policy. Nearby neighbor Lauren Krupp called the police the night of the party to complain about the noise. She said police told her there was already a patrol car in the area. Soon after, Krupp said she heard a loud noise and speculated later it was the sound of the deck collapsing. Krupp spoke about her interactions with the first group of students to inhabit the house, last year at this time. Krupp said she hopes the incident can be a learning experience. 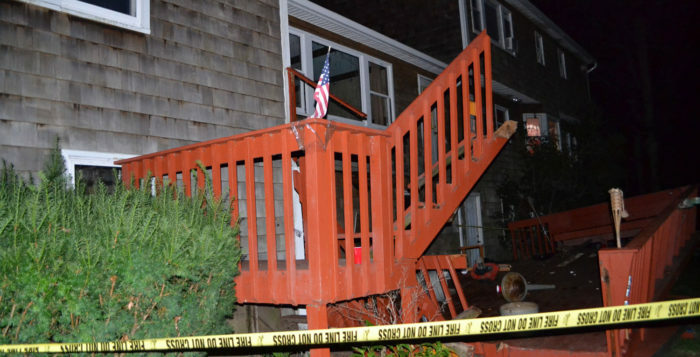 A deck collapses at a home on Old Field Road, injuring at least two. Photo from Town of Brookhaven.